The name “Bodhi Oak” arose long before we had a center, I don’t remember when, or why. The sense of it was that even in this little place, Oakhurst, California, where we lead quiet, ordinary lives, awakening can happen. “Hurst” is of Saxon derivation, meaning “a wooded hill”. So here, I thought, in this oak-studded foothill valley, we can realize Buddha-mind, the mind of awakening that the Buddha taught. He awoke under a ficus tree, a tree indigenous to northern India – we can awaken under the oaks of our own setting. This awakening is not something special, only for sophisticated urban elites or spiritual adepts, but is available to all of us, everywhere. At first, Bodhi Oak sounded sort of jokey, like a cowboy song spoof. Jokes are made about Oakhurst: “Okie-hurst”, and “Okie-ville”. Maybe it is kind of a cow-town. But so what, I thought, I don’t think the Buddha would pass us by because of that. Zen is Zen, I was told by the eminent emissary from Soto Shu, the Japanese governing body of Soto Zen, the lineage to which we belong. I tried Bodhi Oak out on a couple of people – they had the same reaction – they wanted something more serious, maybe. Somehow I thought it was important to have “oak” in the name. I love oaks, and we have a lot of them here: live oak, valley oak, blue oak, black oak. I grew up in Southern California, on a ranch in the San Gabriel Valley. There were oak trees around our house, of a type with branches that were low and wide, excellent for climbing. My mother said that they were of a type that only grew in that area, so they seemed unique, and precious. Bodhi Oak just had a ring to it. It felt like home. So the name, “Bodhi Oak Zen Sangha” became ours. We started regular Sunday morning sittings in July of 2016, at a yoga center in Oakhurst. After a couple of months, we realized that we needed a dedicated space, where we could make tea, store our cushions, and give meditation instruction to newcomers. We started looking for commercial property in Oakhurst. Eastern Madera County has suffered from the recession, so there are a lot of unoccupied properties. We looked at a lot, and got discouraged by expense, location, size, and configuration. Two properties stuck in our minds. One was in the center of town, in a rather up-scale development with wonderful light, high ceilings, wood floors, and a nice bathroom. It was just the right size, we thought. We tried to see how we could justify the expense. The other one was in an aging, rustic strip mall, at the edge of town, below a masseuse, and next to a beauty parlor. Originally, it had been a barber shop, but that had been gone for many years, and since then, there had been a series of short-term rentals. It had tile floors and exposed florescent lighting. It was filthy. But it had light from two sides, because it is on the corner of the building, and a view of the Sierra, if you don’t get too close to the north-facing window. If you do, you look down over a vacant lot that accumulates a lot of trash, and a mini-storage with barbed-wire fencing. It had a bathroom with cupboards for storage, and a small area in the back with a sink and shelves. A room with a keyhole and doorway could be enclosed for a practice discussion and meditation instruction room. Another alcove could be made into a library or storage area. In the entry was a low built-in bench where people could sit to take off their shoes, and a counter for display. We began to imagine a zendo. My husband Steve is a general contractor, building designer, and builder. I asked him to look at it with me. We walked around, and immediately he began to build it out in his mind. It was his idea to create an entry by building a shoji screen that hid the shoe storage from the zendo. It was his idea to use shoji paper to build light fixtures to cover the florescent bulbs and soften the lighting. He could see right away how to enclose the small room, and how to build out the shelving in the sink room to make a little kitchen. We figured out how to cover the tile floor with a rug, and how to paint out the ugly rust and bone colors of the walls. Bodhi Oak Zen Center opened in November 2016, giving us a month to settle in and work out the kinks before we had our opening ceremony on December 10. My teacher, Baika Andrea Heaton Sensei, and her husband Jeff, came from the Bay Area to help, and with about 20 guests, we joyfully opened the zendo. We love our little place. Gradually it has become our home, and we continue to adapt it as our community develops. We show films of Buddhist interest once a month – projecting them onto one of the walls. We move chairs around when there’s a small group for Zen 101—our monthly introduction to Zen and meditation. 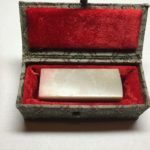 We had our first Jukai there in May – Jukai is the ceremony of lay ordination, when people who have chosen to commit themselves to the Way of Buddha publically dedicate themselves and receive the Buddhist precepts as their way of life. I don’t have the authority yet to give the precepts, but I am learning the process. Part of my training is to learn to inscribe a small area of white fabric, usually silk, but in this case, cotton, using a tiny brush, with both my dharma name, and the dharma name of the recipient. The dharma name is a new name that is given to the recipient at the time of ordination; it is in Japanese, with an English translation, and it is written in Japanese characters (kanji) on the fabric. I know hardly anything about doing that! But that’s another story, because I want to tell you here about the Japanese name for Bodhi Oak Zen Center. The finishing touch on the inscribed fabric is to stamp it with both my dharma name and the name of the “temple” where the Jukai took place, using a “chop” or “seal” with red ink. 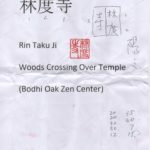 I have a dharma name, and I know the characters for it, but Bodhi Oak Zen Center did not have a Japanese name. Baika gave me the responsibility of figuring out an appropriate Japanese name, and so I began a process that unfolded in a very interesting way. I have a booklet that Baika gave me that has appropriate syllables and their kanji characters for dharma names, and I looked up “oak” there. No citation for “oak”. I looked it up on Google Translate, but the word for “oak” seemed too long. So I looked up “tree”. The word for “tree” is moku木 . Ok, I thought, that sounds pretty good. Then I looked up “enlightenment”. Not so easy. “Awakening” – “dō” 度 or “go”. I have “go” in my dharma name, so I thought that would not be appropriate, and I thought “dō” sounded better: “MokuDō” 木度That sounds pretty good, I thought. I also thought that the syllable “dō” could also mean “Way” as in Aikidō, being derived from the Chinese (dao), which would be a nice pun, I thought. I wrote to Baika to get her take. She approved it, and suggested adding “ji”, meaning “temple”. At first I was resistant to that, because I am pig-headed and I get easily attached to my own ideas. I told Baika that I would also check out the name with Bill Powell. William Powell is a Professor Emeritus at UC Santa Barbara in two Departments: the Department of East Asian Languages and Cultural Studies, and Religious Studies. He and his wife, Yoko, live in North Fork, about 20 miles from Oakhurst. I wrote to Bill, explaining my idea. Well, I thought, that could work. We take the Bodhisattva Vows to close our meditation periods, and consistent with the Mahayana tradition, our own awakening requires awakening with and for everyone. Interestingly, we are in the process of studying the Six Paramitas right now, and paramita is expressed by the same kanji as dō in Chinese 度, according to Thich Nhat Hanh. More about that later. “Yes, Do 度 is paramita, crossing over. BTW, 度 can be also pronounced taku and that feels more Buddhism like and feels friendly. Here are some ideas. Although they still feel unusual for a temple’s name but may be ok.
度木 – Taku moku or Taku boku. crossing over tree(s). 木度 – Moku taku or Boku taku. crossing over tree(s). the latter feels more sharp and the former feels more round. 度林 – Taku rin. crossing over woods. this is unique but maybe nice. 林度 – Rin taku. crossing over woods. this feels somewhat familiar. 森度 – Shin taku. crossing over forest. 度樹 – Do Ju or To Ju or Taku ju. crossing over tree(s). 菩提樹 Boddhi Tree. 樹 = 木. 度柏 – Do haku or To Haku or Taku haku. crossing over oak. 度樫 – Do ken or To ken or Toku ken. crossing over oak. 度木 and 度林 can be names that people would understand the meaning of the names if they learn do/taku means crossing over. A tree that crosses over people and Woods that crosses over people. Oh boy. If there’s anything that appeals to me, it’s the value of his sense and feeling response of the rightness of the name. It’s not too bad that it’s also a female name in Chinese. That’s more than a little bit attractive to me. Sold! I sent Hide’s letter to Bill, to complete the circle. Bill offered these comments: “Yes, Rintaku-ji has the right ring to it — thinking of Ginkaku-ji, Daitoku-ji, Tofuku-ji, for example. The kanji also works well. Part of what made this process so satisfying was the sensitivity with which Hide and Bill approached finding the temple name. They took it seriously, and gave it their full consideration. There was a sense, for me, of a shared process, a shared work, that bore fruit in a beautiful name, with deep reference and resonance. Ram Dass says, “We’re all just walking each other home”. To me, that’s the sense of Rintakuji. We are crossing over together, crossing from the shore of suffering to the shore of liberation. Holding each others’ hands, we found a name for the zendo where we can practice and work together to cross the shore. There’s one more part to this story. Baika had given me the name of a company in San Francisco “New Unique Co.” where you can order a carved stone stamp with the temple name inscribed, for marking documents with the temple name. So my husband Steve and I set out one day to go to 535 Grant Avenue, San Francisco, California, USA. If you’ve been there, you know that Grant Avenue is lined with souvenir shops that are garish and distracting. It’s not easy to see the street numbers, but we found it. It turns out that New Unique Co. is in the back of another shop. We entered, and immediately the woman sitting behind the counter knew what we were there for, and motioned to us to go to the back of the store. Uncertain, we moved to the back. There was no one there, so we waited, wondering what to do. The back of the shop was filled with cases of books in Chinese, art supplies, including a wide range of calligraphy brushes, and calligraphy examples. After a little while, a Chinese man of about my age arrived, smiling and welcoming. I showed him the printed page that I had made with the name and the kanji, and said that I needed a temple seal. He nodded, and quickly showed me samples of stone (marble?) blocks that could be carved with the name. On the paper that I provided, he made a diagram of a square, and rapidly wrote the characters in his own hand, showing where they would go on the stamp. But, he said, they will be in “old writing”. I didn’t know what that meant, but I looked it up later. * He showed me a booklet with various examples of seal formats, and we looked at several before choosing one. With bows of thanks to my teacher Baika Andrea Heaton, Sensei, Professor William Powell, and my dharma brother Hide Yatabe, for helping me and our sangha, and all beings, to cross over. * Seal script is an ancient style of writing Chinese characters that was common throughout the latter half of the 1st millennium BC. It evolved organically out of the Zhou dynasty script. The Qin variant of seal script eventually became the standard, and was adopted as the formal script for all of China during the Qin dynasty (221-206 BC). It was still widely used for decorative engraving and seals (name chops, or signets) in the Han dynasty. The literal translation of the Chinese name for seal script is decorative engraving script, a name coined during the Han dynasty, which reflects the then-reduced role of the script for the writing of ceremonial inscriptions. (Wikipedia) It is still commonly used for seal inscriptions. Beautifully written, Mary-Allen! A wonderful tribute to the ground up formation of the zendo. Blessings and peace to all involved!